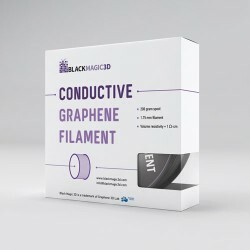 The long awaited Conductive Graphene Filament from Graphene 3D Lab Inc. (GGG) hit the market today. On February 2, the company announced that it had received and assembled an industrial scale thermoplastic extruder line at their Calverton, NY facility to produce their long awaited graphene filament. The filament incorporates highly conductive nano-carbon platelets to enhance the properties of PLA, a widely used thermoplastic. Incorporating graphene into a commercial thermoplastic filament opens up the possibilities of 3D printing conductive traces within a 3D printed part. Though by no means does this mean that 3D printers can all of the sudden print complex electronic devices, it does mean that people can begin to experiment and design simple 3D printed electronic devices, ready-made for additional components. Volume resistivity is the measure of a material’s resistance to electricity within a cubic centimeter of material. In order to determine if the material will work for your project, you will have to keep in mind that the resistivity will change depending upon the print or circuit design. 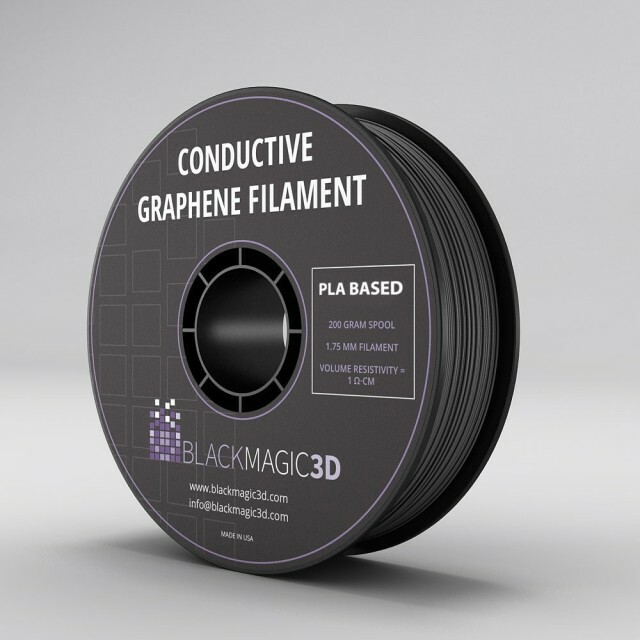 The conductive filament will be sold on Graphene 3D’s recently launched e-commerce platform, Black Magic 3D, which will also be the trade name for all current and future Graphene 3D filaments. "Graphene 3D is excited to begin offering Conductive Graphene Filament directly to customers and opening new avenues of creation for 3D printer users. We anticipate a wide variety of applications, including the 3D printing of conductive traces and capacitive touch sensors. We are looking forward to receiving continued feedback from the 3D printing community as we proceed with the development of a wide range of filaments with functional capabilities. This is an important milestone for Graphene 3D Lab, achieving revenue through the commercialization of functional 3D printing materials and in achieving the Company's goal of building an ecosystem for 3D printing operational devices." Capacitive (touch) sensing These can be used to measure proximity, position, humidity, fluid levels, and acceleration. Examples include gaming controllers, digital keyboards, trackpads, drum machines, and MIDI controllers. Electrically conductive circuitry: The filament is designed for low-current applications, and the resistivity of a circuit has to be carefully accounted for. Electromagnetic and Radiofrequency Shielding: EMI/RF shielding applications are primarily used to block electromagnetic fields and radio frequencies within a given space. EMI and RF shielding is critical in a hospital, a laboratory, or an aerospace setting to protect against competing signals, such as AM, FM, TV, cellular and emergency signals. This could lead to incorrect readings of critical machines and devices. EMI/RF shielding is a critical function in many industries and products, including: aerospace, automotive, telecommunications, hospital equipment and medical devices. High-Strength mechanical and functional parts: Because Conductive Graphene Filament is mechanically stronger than ABS and PLA, it can be used to 3D print functional parts and components like: hooks, hand-tools, and parts which require tooling, including drilling. This new filament can be used on any standard FDM printer, but the company suggests that the extruder nozzle be more than .5 mm in diameter. Even though the new graphene filament will find its way through a variety of 3D printers, less than a month ago the company announced that it had entered into a contract agreement with ZeGo Robotics LLC to develop a prototype of their own 3D printer that is optimized to work best with their proprietary graphene filament. It would be interesting to see the new filament run through multi-material 3D printers like the Mark Forged (carbon fiber, nylon Kevlar) or a Voxel8, which was specifically designed to 3D print electronics. 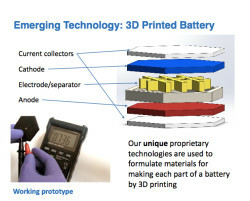 To learn more about Graphene 3D’s Conductive Graphene Filament, check out this video about their 3D printed battery project.